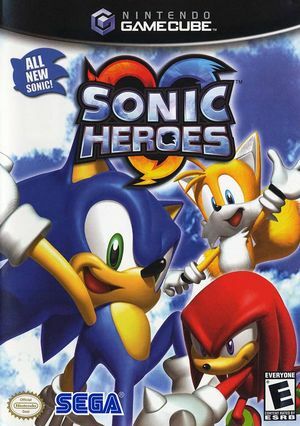 Sonic Heroes is yet another installment in the Sonic series for the Nintendo GameCube. 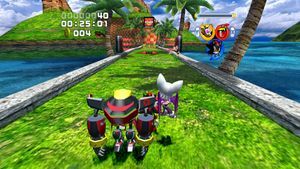 In Sonic Heroes, three characters (in teams, of which there are 4) travel together at once, each with unique abilities which the player can utilise to defeat enemies or tackle obstacles. 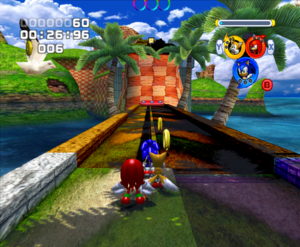 Since 5.0-5745, textures in Sonic Heroes will appear blurry in the distance at internal resolutions above native, due to false positives in Arbitrary Mipmap Detection. Since 5.0-8296, this setting can be disabled to work around the issue. 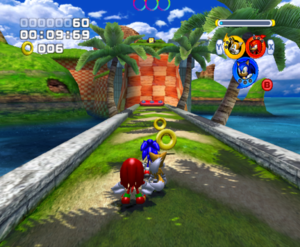 However, if any "mip trick" effects are used by the game, they will not work correctly. In prior versions, the only workaround is to enable GPU Texture Decoding. 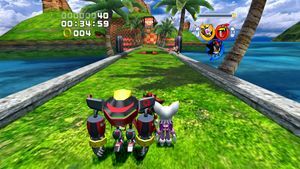 In the multiplayer modes of Sonic Heroes, buttons will act like they were being rapidly pressed in "auto fire" manner, even though they were simply being pressed and held, making it uncomfortable to play. This applies to stick movement as well. On PAL versions of the game, this also happens in the single player, making the game totally unplayable. Fixed by 4.0-8586. This may still happen on some levels in the PAL version. Needs more testing. Odd black areas appear on the right side of the screen in-game on all backends. As of 4.0-1474, the core problem has been partially addressed, see issue 267 and the April Dolphin Progress Report. This can be avoided by enabling the Vertex Rounding Hack under Graphics Settings -> Hacks in 5.0-3251 or newer, though GPU performance takes a hit when enabling this option. It's now on by default for this game in 5.0-8896 and later. The built-in Widescreen Hack causes clipping issues. The following Gecko codes work as a replacement, causing fewer issues. To avoid conflicts, make sure that Widescreen Hack is disabled while using these codes. 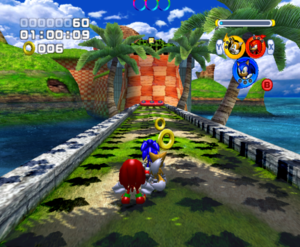 The graph below charts the compatibility with Sonic Heroes since Dolphin's 2.0 release, listing revisions only where a compatibility change occurred. 3.5-1387 Windows 8 AMD Phenom II X4 965 @ 3.4GHz AMD Radeon HD 6850 Constant 60FPS. Runs perfectly, no problem. This page was last edited on 15 October 2018, at 07:27.